With the release of Bioethanol, the third in a series of Biofuel catalogs from Cole-Parmer, customers have resources to choose testing equipment that helps them meet ASTM standards. Along with key testing products, the catalogs detail which specifications of ASTM apply and what is needed to pass the test methods. The Biodiesel catalog includes critical information for meeting ASTM D6751. Biodiesel fuel blend stock (B100) is comprised of mono-alkyl esters of long chain fatty acids derived from vegetable oils or animal fats. Biodiesel fuel is normally produced from a reaction between vegetable oil or animal fat and methanol or ethanol in the presence of a catalyst to produce mono-alkyl esters and glycerin, which is removed. The biodiesel product attributes approximately 10% of its mass from the reacted alcohol. The catalog includes copper corrosion test baths, carbon residue furnaces, density meters, and much more to meet testing requirements. The Biodiesel Blend catalog references ASTM D7467 for Diesel Fuel Oil, Biodiesel Blend (B6 to B20). These fuels blend grade of 6 to 20 volume percent biodiesel with light middle or middle distillate diesel fuel. The biodiesel component of the blend must conform to the requirements of ASTM D6751, Biodiesel Fuel Blend Stock (B100) for Middle Distillate Fuels. Find a selection of equipment including analyzers, viscosity baths, oil test centrifuges, manual flash point testers, and much more. 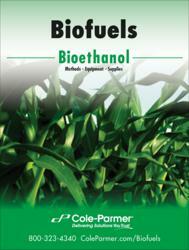 The Bioethanol catalog contains information to meet ASTM D4806 requirements. This specification relates to nominally anhydrous denatured fuel ethanol intended to be blended with unleaded or leaded gasolines at 1 to 10% for use as automotive spark-ignition engine fuel. The denatured fuel ethanol must be visually free of sediment and suspended matter, and be clear and bright at ambient temperature or 21°C. Choose from titrators, spectrophotometers, existent gum test baths, and much more. For more information, call 800-323-4340 or visit coleparmer.com/Category/Biofuels/59179.